Summary: Wow! A spectacular sunny day and nearly 6200 vertical feet of skiing from Camp Muir to the Nisqually Bridge, with about 60% of that vert on beautiful corn snow. Fantastic! Details: After a couple of days of sunny weather to consolidate the snowpack, I figured Monday provided the best chance of finding some nice corn on south facing slopes. I decided to try the usual Muir Snowfield trip, but as I drove up the icy road towards Paradise, there was a skier waiting by the roadside at the Nisqually Bridge parking lot, looking for a ride. This was Julie from Olympia (who has summited Rainier 40 times ! 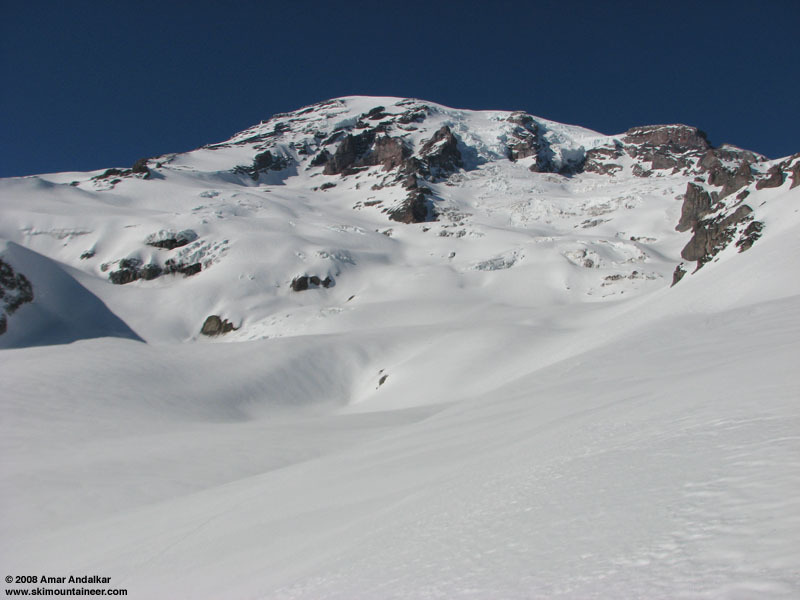 ), and she was planning to ski solo from Camp Muir to the bridge. She offered me a ride back up to Paradise at the end of the day if I wanted to ski down to the bridge too. It had been a couple of years since I'd last skied to the bridge, and an extra 1500 vertical of skiing sure sounded nice! The Paradise lot was surprisingly uncrowded even at 9:45am on a holiday (by the way, the parking lot beside the new visitor center is largely OPEN to the public, there are about 100 more spaces available than there were during the summer or fall of 2007). The skin up to Muir was uneventful, although Pan Face was a bit too icy for comfortable skinning. A cool gusting easterly wind at Paradise soon faded to dead calm and warmth above the inversion layer near 7000 ft. Even at Camp Muir there was only a light 5-10 mph SW breeze, with temps comfortably above freezing. We skied down just after 2pm, on firm but mostly smooth windpacked snow on the main portion of the Muir Snowfield above 8000 ft. Heavily wind-affected, but at least it was easy to find a meandering ski line connecting the large patches of smoother snow. There was very little real sastrugi, no hardened icy ridges of frozen snow. Below 8000 ft, the snow smoothened and quickly transitioned to silky corn, especially on the Pebble Creek rolls. We followed the bed of the creek down and to the right from the 7200 ft sign into the large bowls which lead to the Nisqually Glacier. Excellent snow, 2-4" of well-softened corn on this 30-degree SW facing slope. No signs of instability as we skied, despite there being a firmer icy layer several inches below the surface. 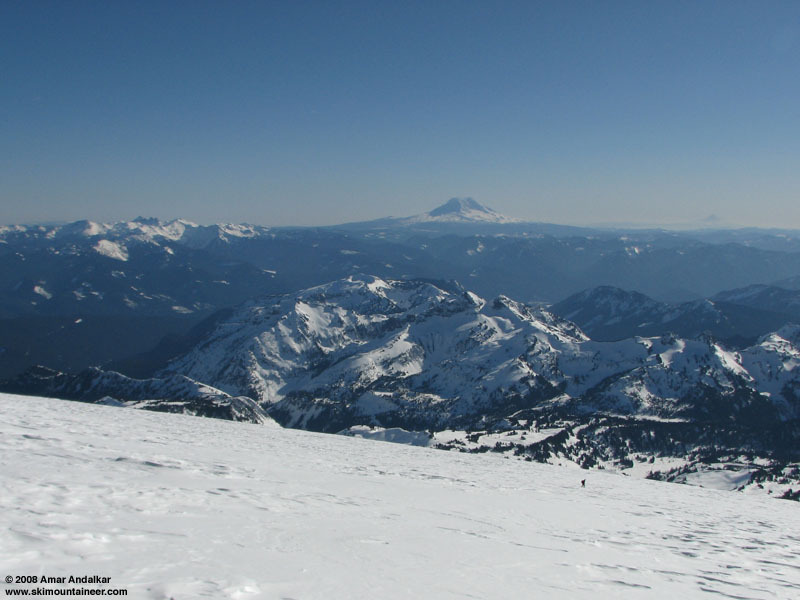 Windpacked snow on the upper Muir Snowfield, with the Goat Rocks, Mt Adams, and Mt Hood in the distance (left to right). The snow on the moraine and the Nisqually Glacier itself remained wonderful, nicely softened corn without any stickiness or gloppiness. We skied right down the untracked middle of the glacier, eventually cutting to the right just above the terminus and skiing the gully there down to 4500 ft. We noticed a few older ski tracks on the Nisqually, probably from Sunday. We also looked back and saw a pair of skiers descending the not-quite-Nisqually-Chute, i.e. the cliffier and rockier slope just to skier's left (SE) of the main Chute. They probably picked that line to avoid the potentially serious avalanche hazard in the main Chute on this sunny afternoon. Looking back towards Mt Rainier from the edge of the Nisqually Glacier. Below 4500 ft on the flats of the Nisqually River bed, everything was covered with huge piles of avy debris from earlier storm cycles, all topped by several inches of more recent snow. Only a single pile of debris sat atop the newest snow, which had come down sometime this weekend from below a very steep cliff and frozen waterfall, facing SW. As we skied the river bed, in the space of a few ski lengths the snow surface transitioned from blissful corn to a sudden HALT. It was very sticky and difficult to glide, but at least it hadn't softened to bottomless mush. And the sticky snow definitely made it easy to ski up the gentle grade of the former road bed to reach the SE end of the bridge, without needing skins. The snowpack is roughly 6-8 ft deep at the bridge, at 3900 ft. As we crossed the bridge on foot (no sidewalk, it's full of snow), a ranger driving by stopped his SUV and extracted full details of our ski descent and snow conditions. 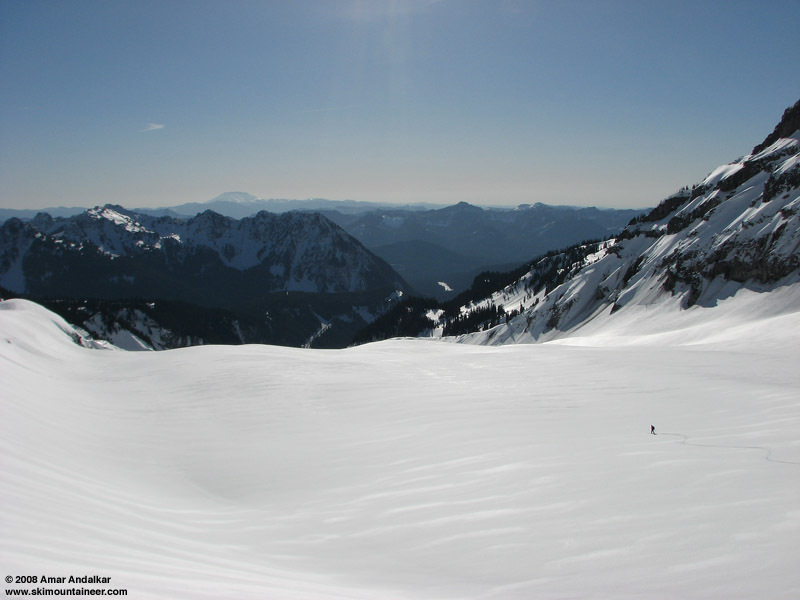 Skiing down the Nisqually Glacier, with Mt St Helens in the distance. Nice Work Amar and Julie....sounds great! "You keep skiing, I'll keep filming"
Nice one, you guys. I was wondering if that would be in the kind of shape you found. Very good Amar! Julie is kinda all over the place including Everest. Question? You mention decending skiers right of terminus.Is the left or east side of terminus still doable as well? Yeah! Thanks for the report. I don't know Amar, that rendezvous sounds fateful to me. Great report and photos as always! Hey Amar, thanks for the trip report and photos. It was my mom and I who came down through the rock band above you, she was visiting from NY and it was her first turns of the winter. The snow was great and seemed stable despite the late hour. We actually got a ride back to paradise with Julie, who apparently had a ski fall off her car. Not sure if she ever found it though. Sure, the other side is skiable, in fact the old ski tracks from the previous day went that way. The spot where the river exits the glacier terminus (which is often a hazardous, steep-walled icy pit that you have to traverse above on that side) is actually pretty well filled in now and looks to be apparently safe. But hidden snow-covered glacial rivers scare me, more so than hidden crevasses. Since we were skiing down sight unseen from above, we guessed that the much steeper, SW facing slope on that side would be riskier during a warm afternoon, so we opted for the gentler and safer descent to skier's right.